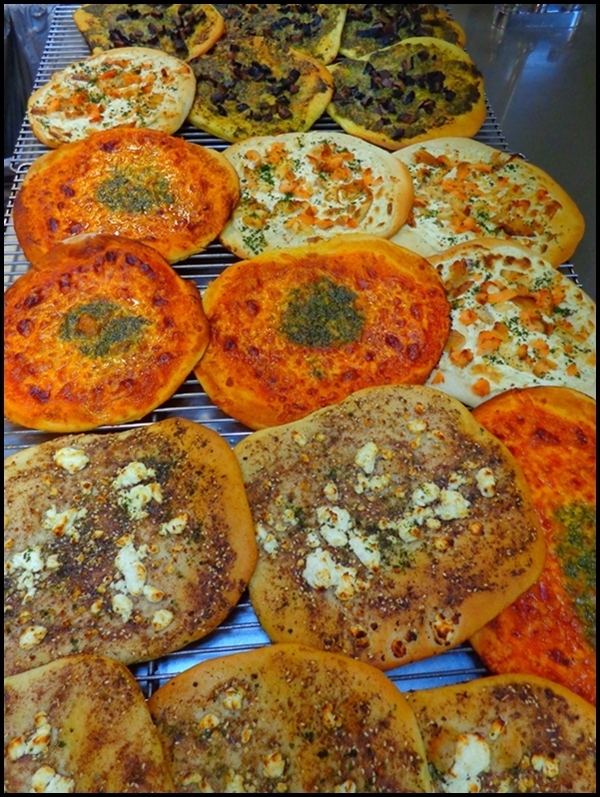 Pizzas Pictured (from front to back): Za'atar and shanklish; Margherita; boursin cheese with smoked trout and smoked salmon; pesto and portobello mushroom (click the image for a larger view). One of the aspects of food that I have always found interesting—besides cooking and eating it—is its history. And to study food history is in a certain way studying civilization itself. Even common everyday foods have a history…someone had to be the first to make it. Case in point: Pizza, which of course is nothing more than bread with stuff on it. While pizza is so common in America it may as well be an American product, but of course it is not (and of course I am writing this from purely an American view). Nor—some may be dismayed to learn—are its origins Italian, at least not exclusively. Pizza, or simple versions of it, most likely began east of Italy; Greece maybe, or possibly Egypt or the Levant. 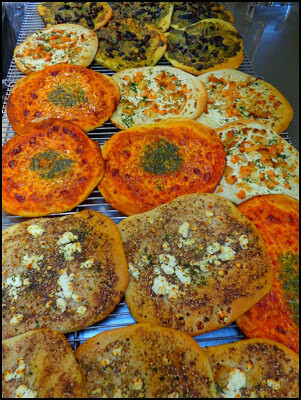 Some speculate that the ancient Phoenicians first developed a seasoned flatbread that was pizza’s precursor and brought it on their nautical travels. The etymological origins of pizza are said to come from the Greek word pita (or pitta), which means pie or a sort of flat cake. The Eastern Mediterranean is the area where bread, and specifically flatbread, first came into existence. In many Middle Eastern countries today, where bread is still baked flat, it is not only a foodstuff, it is also a utensil. It was surely only a matter of time before food was baked onto the bread. What I find truly interesting is that while more toppings were added as pizza evolved, there were originally no tomatoes to be had; they didn’t arrive in Italy (from the “New World”) until the 16th century and weren't considered edible until the early 1700's. One of the first recorded pizzas to resemble those that we know today is the still-famous Pizza Margherita. It was first baked (or at least first served) on June 11, 1889 by a cook named Raffaele Esposito. He was catering an event for Queen Margherita di Savoia and paid homage to the colors of Italy's flag: red (tomato), white (mozzarella) and green (basil). I can’t help but wonder what the cook’s outcome would have been should the Queen not have liked the new fangled food. Pizza as a recipe is exceedingly easy to prepare. Most people are afraid of homemade dough but it is really very simple and will get easier the more you make it. There are plenty of pre-made and often frozen doughs available, but with the aid of an electric mixer you can make good quality dough in the time it takes to thaw one out. A couple key things to remember are to preheat your oven and don’t overload the pizza with too many or soggy ingredients otherwise the pizza itself will be soggy. And remember, also, that the next time you bite into a slice of steaming hot pizza, whether you made it or purchased it, what you have in your hand is not only food…it’s a veritable (and edible) slice of history. Combine the water, yeast, and 2 cups of flour in the bowl of an upright mixer; stir, cover, and allow to ferment 30 minutes. Add the remaining 4 cups flour along with the olive oil and yeast. Fit the mixer with a dough hook and begin mixing on low speed. Once it forms a ball turn the speed to medium and knead about 8 minutes. Transfer the dough to a lightly oiled bowl and cover with plastic wrap; allow the dough to ferment and rise for 1 hour, or until it doubles in size. At this point it may be rolled out for pizza, used to make bread, or refrigerated for a few days; it can also frozen for up to 6 months. Preheat an oven to 475 F. Lightly oil 2 (12 inch) pizza pans (or square baking pans). Divide the dough and roll out and transfer it to the pans. Distribute the ingredients across the dough with the cheese being last. Bake the pizzas for 15 – 20 minutes, or until the bottoms are crisp and the cheese is golden. Allow to cool for 5 minutes before slicing. Preheat an oven to 450F. Heat the olive oil in a large skillet and add the onion and sauté for a minute or two. Then add the garlic and sauté another minute. Add the spinach and salt to the pan, turning and stirring it to coat it in oil. Cook the spinach just a minute or two, or until it wilts; transfer it to a plate to cool slightly while you roll out the dough. Lightly oil (2) 12 inch pizza pans (or square baking pans). Divide the dough and roll out and transfer it to the pans. Distribute the ingredients across the dough with the cheese being last. Bake the pizzas for 15 – 20 minutes, or until the bottoms are crisp and the cheese is golden. Allow to cool for 5 minutes before slicing.